Why Aadhar card Lock Require? How To Unlock Aadhar Card? Aadhar Card is one of the vital document proof in India(as per UIDAI data 115+Cr aadhar card generated till now). Aadhar card needed in work like buy a sim card, buy a vehicle, government organization like a bank, post office, and many. so there is may chance they will misuse your aadhar card (UIDIA has also received many complaints), that’s why UIDIA has implemented new functionality called “aadhar card lock” and “Aadhar card unlock”so you can easily lock you aadhar and prevent misuse of aadhar card in this article, I will teach to how to lock&unlock aadhar card online. How To Lock Aadhar Card Online? STEP 2: Enter Your 12 Digits Aadhar Card Number or 16 Digits Virtual ID Number, Enter Security code and click on Send OTP Button(You can also use TOTP). STEP 3: You Will Received OTP(One Time Password) On Registered Mobile Number, Enter This OTP and click on submit button. STEP 4: here, your aadhar card lock is currently disabled, we want to lock our aadhar so enter a security code and click on enable the lock. 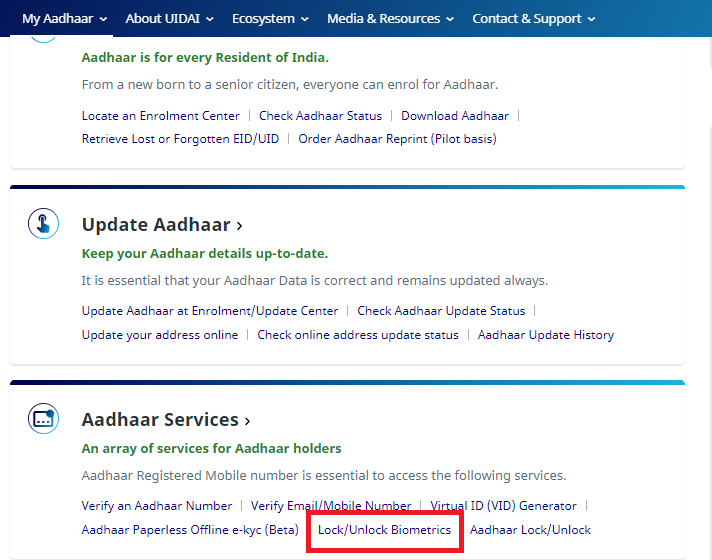 STEP 1: Go to Aadhar Card Official Website https://uidai.gov.in/ and click on Lock/Unlock Biometrics. STEP 2: Enter Aadhar number Or Virtual ID number, Enter Captcha code and Click on Send OTP Button,You Will Get OTP On Register Mobile Numer Enter this OTP and one Submit Button. Step 3: Your Aadhar Card is Currently Locked so Enter Security Code and Click on Submit Button. That’s It, Your Aadhar Card Unlocked Successfully.